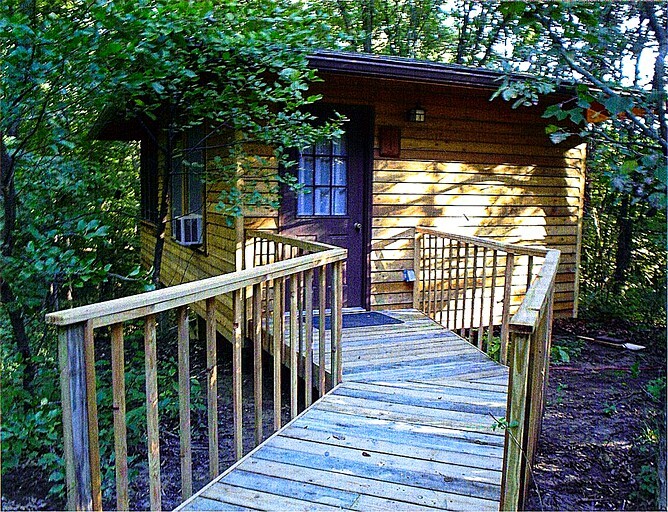 Here, guests can take a much-needed getaway break to this romantic rental for a unique cabin camping experience near Peoria, Illinois. 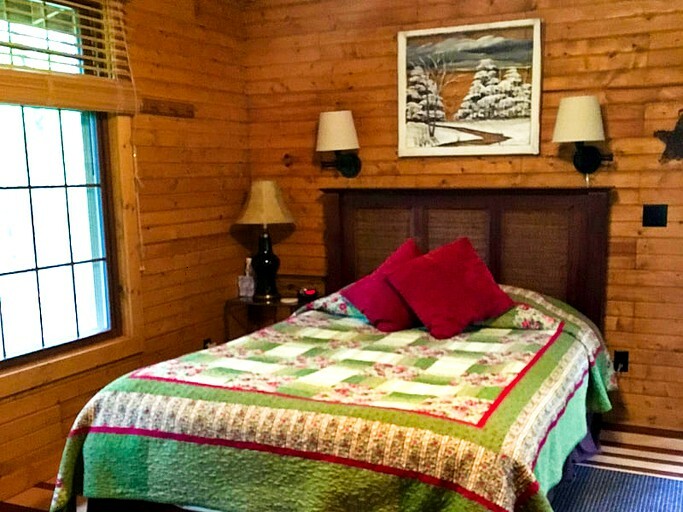 There is one bedroom with a queen-size bed for glampers to enjoy the peace and serenity of the woods that surrounds the cabin. There is also a small table with two chairs, as well as a sofa chair to unwind in. Wrapped around the main lodge, which is shared among all our guests, are cedar decks which offer all guests breathtaking and inspiring views of the forest. Sunrises and sunsets, as well as a nighttime sky filled with more stars than guests have ever seen, are regular entertainment here. In the lodge guests will also find a lounge equipped with a TV and Wi-Fi access. 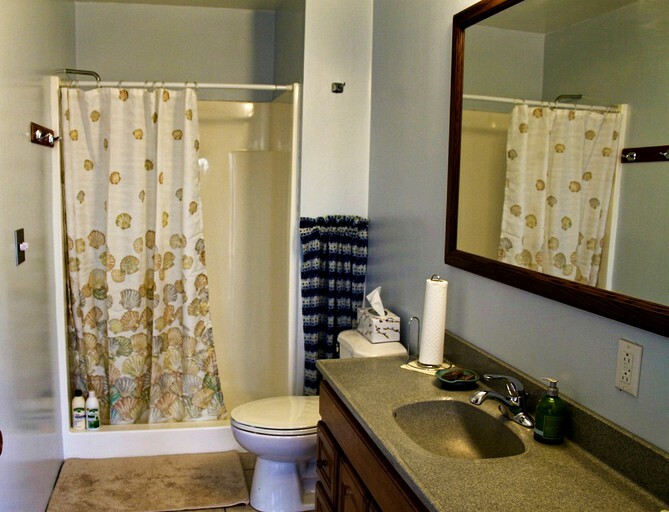 The guest bathhouse features two full-size bathrooms with walk-in showers and four half-baths. This bathhouse is shared among all guests. There is Wi-Fi available throughout the main lodge area. Glampers will find there to be limited cell phone reception at this site, but US Cellular receives the most successful connection. There is also a flat-screen TV and DVD player in common area and guests are welcome to use the landline free of charge. The guest bathhouse features two full-size bathrooms with walk-in showers and four half-baths. This bathhouse is shared among all guests. Glampers can choose to have additional meals prepared for them for an extra fee. Vegans can be accommodated. There are a number of excursions and guided tours that glampers can take for an additional fee. This glamping site is located in beautiful Schuyler County, eight miles northeast of Rushville, Illinois, just one and a half miles north of Rt 24 on Ray Road. It is approximately a one-hour drive from the following cities: Peoria, Quincy, Springfield, and Galesburg and lies at the southwest end of the Spoon River Scenic Drive. There is plenty on offer in Rushville from a variety of restaurants, shopping establishments, a restored movie theater, antique shops and much more. The downtown square includes a picturesque gazebo, restored old buildings, brick-paved streets, and many trees. This is a beautiful area that provides endless hours of relaxation. Should guests wish to venture away from the tree-top decks, there are also many other activities to entertain them. Guided or self-guided hikes through this beautiful natural area are available, as well as wildlife viewing. There is a nature center and a nature playground for glampers to learn more about the environment and the outdoors, in addition to a green living workshop, organic gardening, and team-building challenge courses. Glampers can enjoy canoeing from experienced guides and equipment will be provided for them. Other activities include casual bicycling and mountain biking in the area, and during the right season, glampers can take part in cross country skiing. When night falls, guests can star gaze while relaxing by the campfire if the weather permits it. The most recent project here was the construction of a stairway that goes all the way to the creek down in the valley, with a total of 112 steps. The stairway has made the trail system much more accessible, with an easy way up and down the scenic hillside and a 24-inch by 12-inch deck halfway down, which is perfect for a morning coffee, bird watching, or simply for use as a resting place on the way up or down. Illinois River is 10 miles away, in addition to other local lakes. Antiquing is available throughout the area, as well as other unique shopping. There are four area State Parks within 40 miles. Abraham Lincoln historic sites are within 20-60 miles and Dickson Mounds State Museum is a 30-minute drive away. Emiquon and Spunky Bottoms Wetland Restoration sites are also 30 minutes away. For those who love sport, there is an 18-hole golf course just 10 minutes away and the Ridge View Winery is 30 minutes away. 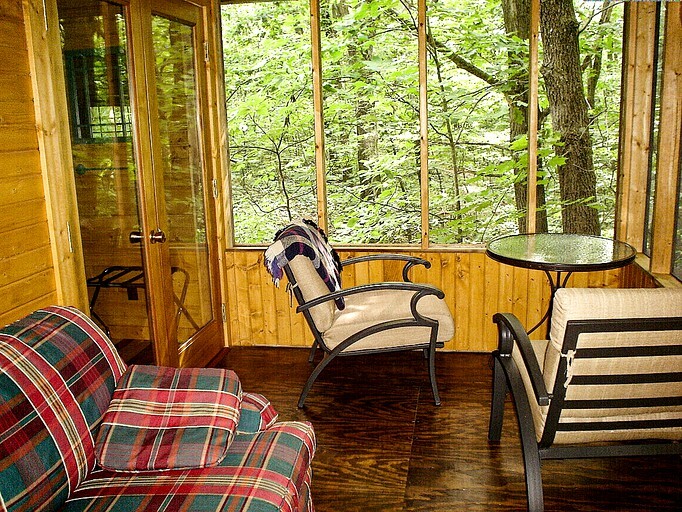 Guests aged 12 and older staying in the Cherry Cabin, Sycamore Cabin, and The Tree House will be counted and charged as adults. Check-in and check-out times are flexible (within reason).